Dream Final. Eliasson (SWE) vs. Kärkkäinen (FIN). The world's two dominating Racketletes - continuously since the very beginning of international Racketlon in 2001. Generally, this year's Finnish Open, as usual, offered a Men's Elite field of almost world championship standard (see preview). For a taste of some of the action in Espoo (Helsinki) over the weekend read the reports below. The Racketlon Finnish Open ended with the dream final everybody was expecting between the world's two best players. Four times World Champion Mikko Kärkkäinen vs three times World Champion and world ranking number one Magnus Eliasson. Kärkkäinens start looked promising as he took the table tennis 21-12. 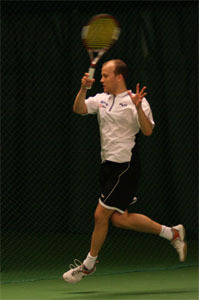 The badminton was even but Kärkkäinen managed to increase his lead by two points; 21-19. 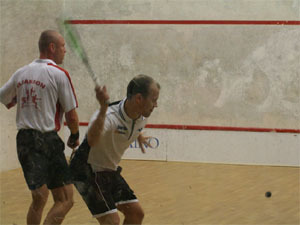 In squash Kärkkäinen took an early lead and it looked like he was going to a comfortable win. Kärkkäinen leading by +11 before squash. However, once in the lead Kärkkäinens game changed to playing safe instead of going for winners which had brought him the lead. This suited Eliasson fine and he cruised to a 21-15 win, which meant a 5 points lead for Kärkkäinen before tennis. But Kärkkäinens lack of competition was showing throughout the match and Eliasson took the tennis 21-15 and a one point victory to become the Finnish Open Champion. Im lacking motivation at the moment and the only thing in Racketlon that turns me on at the moment is playing Mikko, said Mr. Racketlon Magnus Eliasson. 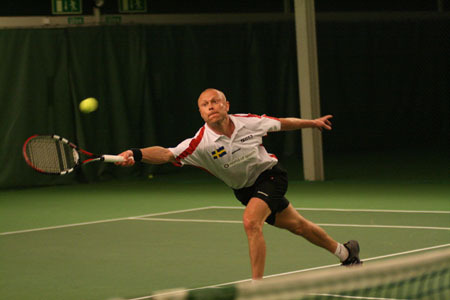 In the match for 3rd place Stefan Adamsson beat Pekka Kainulainen by four points. Michaela Björnström made it all the way to the final in the Mens B-class where Olli Marjamäki became too strong. The C-class was won by Sami Orakoski. Volker Sach beat Anders Lundström in the veterans +45 and the +55 class, finally, was won by World Champion Sten Lindström. Lundström. Had to given in to world no.1 this time. -) It has become a bit of a theme to see Eliasson win these "battles of the giants" between World Championships while Kärkkäinen wins at the Worlds. 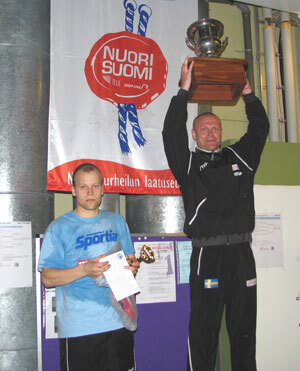 For example: Eliasson won at the Finnish Open 2006 but lost at the Worlds in Belgium two months later. And, again, at the Austrian Open 2007 Eliasson won but lost heavily at the Rotterdam Worlds one month later. 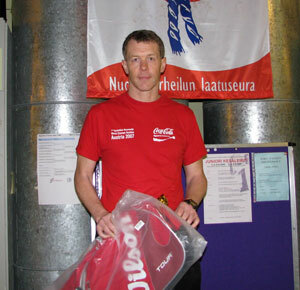 In fact, Kärkkäinen has only lost to Eliasson at a World Championship on one single occasion; in Vienna 2004 - in the semifinal. Peersman (seeded 3/4) fell against Kainulainen who then advanced one more step to face Eliasson in the semifinal. -) In the Men's Veteran class World no.1 Volker Sach achieved a break in a long series of recent losses to Finland's Anders Lundström. During the last year they have now faced each other no less than six times, often in a world tour final, and Sach has only won once before; at their first encounter in Germany last summer. Despite the overly dramatic play on words in the title, the first thing to say is that this tournament was well organised, at a nice venue and that the hosts were nice in that quirky way that Finns usually are. The organisation was effective and unobtrusive and the volunteers helpful and friendly. Thanks to everyone. But is the Party Finnished? Another terrible play on words, but one had to wonder about the future of Racketlon especially since we were at the self proclaimed original Racketlon country. It may seem yet more anglo-centrism to say there was too much Finnish spoken at this tournament but the reasons for English being dominant at other tournaments were conspicuous by their absence. So not just Foster and O'Donnell, but Koepf and Zwiers, Weigl and Dickert, Mullamaa - and any other number of international Racketlon regulars. In the men's B alone a Frenchman and a German withdrew late in the day. So is Racketlon in trouble? Well you don't need a super-economist like Racketlon star Professor Peersman to note a tendency to economic downturn. And of course, whatever the local reasons, this tournament presumably needs to think about its timing just 2 weeks after Belgium when one suspects many of the list above were there. I was only in Finland myself because I couldn't get to Oudenaarde. Again, Professor Peersman may be able to confirm that unless we are talking about capitalism, it is perfectly possible for something to be healthy without growing, but given some of the logistical struggles of Racketlon, and the lack of a junior base to feed new recruits, I at least wondered about the future of my beloved sport. Most notably, where were the ever keen Estonians? The answer is "near but not here". While I'm here, allow me to challenge Calum to my own '4-sport' version of 'Racketlon'. 1. Real tennis (because I doubt he's ever played; www.irtpa.com) 2. Pool (I went to university for 8 years). 3. Mental arithmetic (not strong in the calculator generation) and 4. Drinking (I said I went to university for 8 years). The above is a slightly convoluted way of bringing up the subject of rankings. I know there is a bedding in period and in a way I'm not complaining, but isn't it becoming obvious it's getting ridiculous? But even if you disagree with that, let me tell you about 'Real Tennis'. It has some advantages over Racketlon; a single sport with recognised clubs and players are usually quite wealthy. But it is not easily accessible (at least in 25% chunks like Racketlon) and it is only played in 4 countries (UK, USA, Australia, France) by approximately 2000 players in total. But this archaic game, beloved of Henry the 8th of England and originally set up for gambling purposes, was revolutionised in the 1970s not by a change in the rules but by its ranking system! I am looking into this at the moment but it was set up by some boffins and a computer. The details are less important than the consequences. Because of those boffins, every real tennis player in the world has a handicap (like golfers). Accordingly you may play only a few times or many times but you have an idea of your real standard compared to other players. This allows the results of all real tennis matches (and not just tournaments) to influence handicaps. For a sport like Racketlon with a basic 84 points to play for per match this ought to be possible to sort out and, what is more, already existing results could be used to model it. And, like happens with golf, all future games could help modify one's handicap. Handicaps would enable reasonably accurate seeding of tournaments even if, ultimately, a different 'league table' were introduced to indicate tournament success. It is probably enough to finish by saying that someone who has won 6 matches and lost 26 in B and C categories in recent years ought not to be about to re-enter the world's top 100, virtually unassailable as Wales number 1. 2008-06-21: Added "sidenotes" by Lloyd Pettiford. Added photos.